I've been noticing a lot of black interior doors lately. Shiny black high gloss doors. Hmmm, my next project?? It's the gorgeous contrast that I love so much. And my affinity for black and white. Plus I think it could really work with light walls and high gloss white trim. 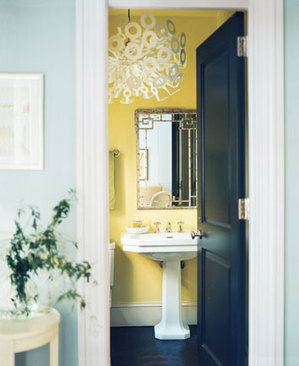 Oh and of course it could look really nice with some crystal door knobs.